Pacific Electric car no. 5132 rumbles eastbound at Tujunga Wash on September 27, 1952. Learn more about this photo and its photographer Alan Weeks by clicking here. PE 5132 is eastbound (technically inbound, note the front trolley pole is locked down). 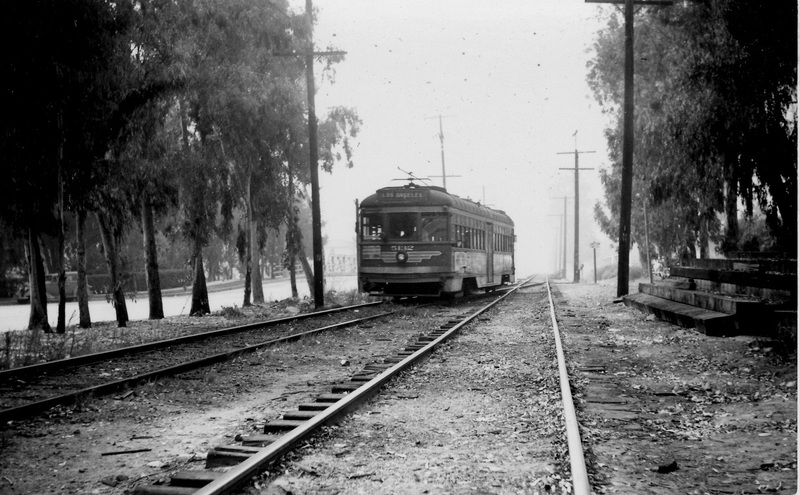 The streetcar is at Hollywood Park station, located about one-half mile west of North Hollywood station and depot. The streetcar has just transitioned from the single-track section along Chandler Boulevard and is entering the double-track section. I never knew about this electic cars tracks going threw the Tujunga wash, what year is this? Chandler Blvd.another private right of way. that could be used AGAIN!!! This was shortly before the electric railway service was abandoned. What was probably the last passenger train through here was an excursion sponsored by what was then Orange Empire Trolley Museum in Oct. 1968. We had a photo stop near this location. COPYRIGHT © MOUNT LOWE PRESERVATION SOCIETY INC. ALL RIGHTS RESERVED. NO UNAUTHORIZED USE OF CONTENT WITHOUT WRITTEN PERMISSION.